SWIMMING HEDORAH (SMOG MONSTER)! 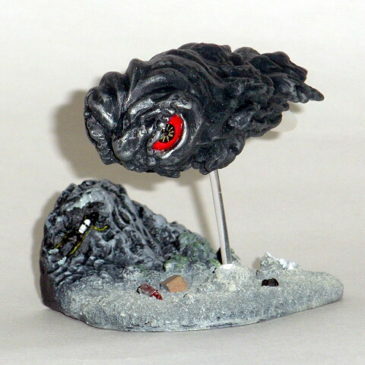 From the Cast Co. of Japan, this wonderful Diorama captures Hedorah in it’s Swimming form. This figure was released for a Toy Show in Osaka in mid December 2010. Made of Poli Resin, the Smoggy measures approx. 3 1/2 inches long. The base representing the bottom of Tokyo Bay filled with debris (tv sets etc.) measures approx. 2 1/2 inches by 2 1/2 inches. The Smog Monster’s eyes are a GLOWING RED! All of Cast Licenses are for producing “Ornaments” so the Smoggy has a plastic hang tag holder attached. COMES MINT IN BOX (opened once to take the photos). 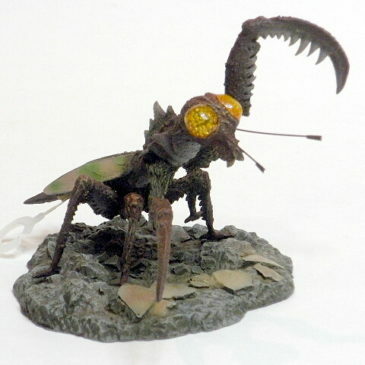 This wonderfully detailed Gaira figure stands approx. 4 inches tall. The diorama is made of Poli Resin and has a base of approx. 6 inches long and 3 1/2 inches wide with a 4 inch Giara splashing through the angry ocean. The ocean is actually TRANSLUCENT! COMES MINT IN BOX. CLAWMARK TOYS WARNING: NOT SUITABLE FOR VERY YOUNG CHILDREN DUE TO BREAKABLE POLI RESIN CONSTRUCTION. Scroll down to see additional action photos! RODAN AND MOTHRA LARVA! Cast Company Japan has produced another fabulous diorama exclusive for the OSAKA Toy Event 2011. 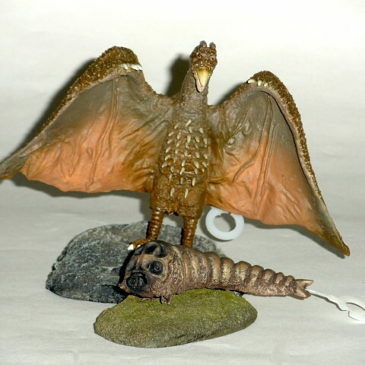 This diorama has the classic 1956 Rodan aka Radon and the classic Mothra Larva together. Each figure has its own separate stand and the figures are beautifully detailed. The rodan stands approximately 5 inches tall with an almost 6 inch wing span. Mothra larva has an OPEN MOUTH and is about 3 inches long. COMES MINT IN ORIGINAL BOX WITH PAPERWORK. This is the Special “MONSTER LAB” version GMK Godzilla Diorama made by CAST CO. of Japan! This highly detailed diorama is made of poly-resin. The sculpt is really amazing! 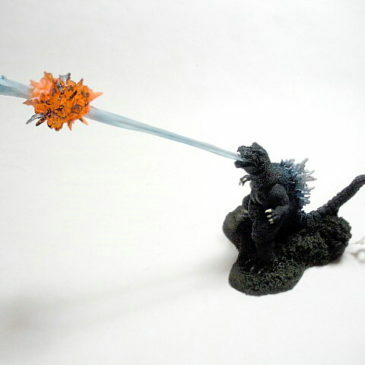 GMK Godzilla is using his ATOMIC BREATH to knock a JET FIGHTER from the sky. The coloration and detail of this diorama is really striking. 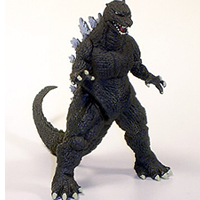 The GMK Godzilla figure stands approx. 5 inches tall. This Diorama comes with the GMK Godzilla HEART. At the end of this action packed GMK movie you see the still beating heart of Godzilla. This diorama comes with the HEART! The license for Cast Co. is for “ornaments” and so the base of the Diorama and the heart both have “hanging tags” attached to them. This Diorama was made by special order from the nice people at MONSTER LAB which is a great Godzilla Toy store located in Tokyo. We were only lucky enough to get our claws on a a few of these dioramas. COMES MINT IN BOX. CLAWMARK TOYS WARNING: NOT FOR VERY YOUNG CHILDREN DUE TO SMALL PARTS. BATTLE DAMAGED MEGAGUIRAS FROM CAST COMPANY OF JAPAN! 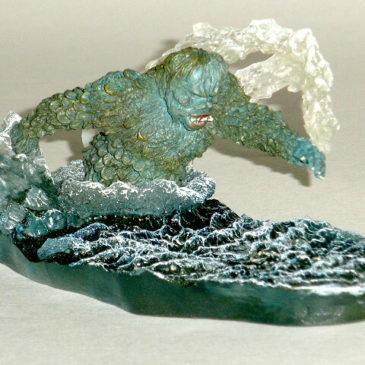 This outstanding poli resin figure captures the EVIL MEGAGUIRAS after GODZILLA RIPPED ONE OF HIS CLAWS OFF! He has a wingspan of approx. 4 1/2 inches and his body is approx. 3 1/2 inches long. He comes with a small piece of the rubble from his big battle. You can pose Megaguiras with one wing tip on the rubble for display. 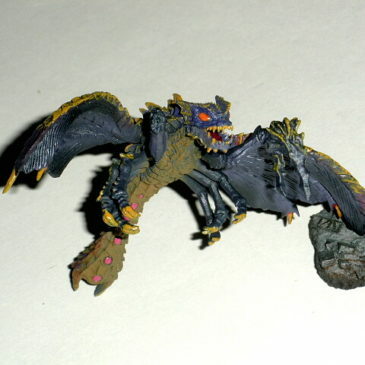 This BATTLE DAMAGED MEGAGUIRAS is highly detailed. This sculpt really captures HOW EVIL MEGAGUIRAS LOOKED! CLAWMARK TOYS WARNING: NOT SUITABLE FOR VERY YOUNG CHILDREN DUE TO BRITTLE POLI RESIN AND SHARP POINTS. RODAN STOMPS ON THE RAIL YARD IN SASEBO, JAPAN!! 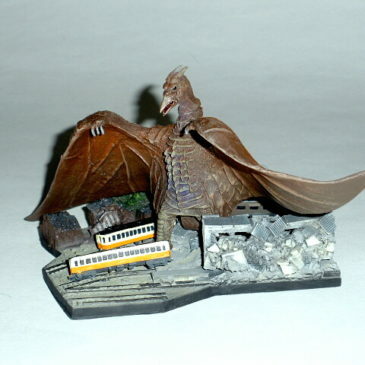 From Cast Co. of Japan, this highly detailed and colorful Diorama shows Rodan 1956 stomping on the train station. Rodan stands approx. 4 inches tall with a wing span of approx 5 1/2 inches. This wonderful diorama is made from poli-resin and the sculpt catches the action from the 1956 Toho Sci-Fi thriller “RODAN!” Rodan is one of the few Toho Kaiju that actually eats people! The movie RODAN was filmed in Kyushu Island and partly in the city of Sasebo (where Tom & Diane met). 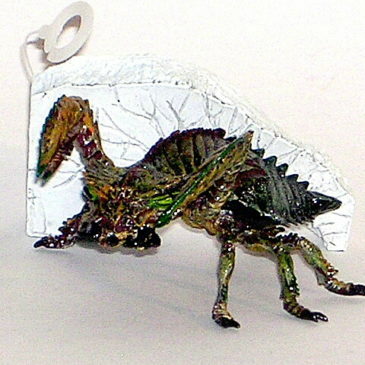 The Cast Co. license is for “Ornaments” and so the base and the Rodan both have “hang tags” attached to them. This awesome diorama comes MINT IN BOX. CLAWMARK TOYS WARNING: NOT SUITABLE FOR VERY YOUNG CHILDREN DUE TO SHARP POINTS. 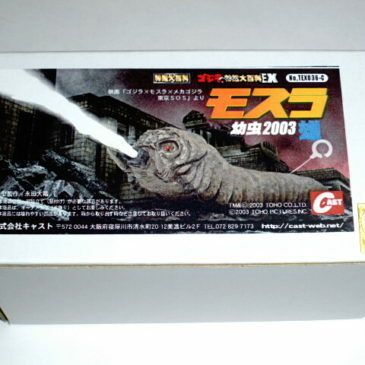 This is the MOTHRA LARVA SHOOTING WEB Diorama made in 2008 by CAST CO. of Japan! This highly detailed diorama is made of poly-resin. The sculpt is really amazing! The coloration and detail of this diorama is just EXCELLENT! This “BLUE EYED” LARVA was featured in Godzilla Vs. Mechagodzilla “TOKYO SOS.” Approx. 4 1/2 inches in length, the LARVA is shooting out a stream of its “WEB” that it uses to fight it’s FOES! This LARVA comes with a Diorama base for display. The web that the Larva is shooting is approx. 5 inches long making the entire Diorama approx. 9 1/2 inches long. The license for Cast Co. is for “ornaments” and so the Larva has a “hanging tag” attached. COMES MINT IN BOX (opened once for taking photos). A REALLY COOL piece by Iwakura which is now called CAST Company Japan; the EVIL MEGANULON from the Toho movie Godzilla vs Megaguirus. This is the first incarnation of Megaguirus; the larval meganulon. One of the great scenes from the movie has an army of Meganulon climbing up. THE TOHO MOVIE THEATER BLDG. IN SHIBUYA in Tokyo!!! The figure is made of painted die-cast metal measuring approximately 4 1/2 inches long. The Iwakura-Cast pieces are designed as ornaments which can be hung. The detail and coloration is amazing. It comes with a cutaway of its shell and ornament hanging tag. This Giant Mantis is menacingly posed to attack with its deadly front pinchers. The eyes are a glowing golden resin. From an Osaka Event comes this incredible Kamakirus Figure made by Cast Company Japan in 2010. The figure is made of polyvinyl resin and is approximately 4 inches long and 3 inches high. It comes with its own stand which is 3 1/2 inches in diameter. All of Cast Licenses are for producing “Ornaments” so the Kamakirus has a plastic hang tag holder attached. THIS IS A VERY DETAILED KAMAKIRUS! GODZILLA vs. the JAPANESE NAVY! The Cast Co. of Japan has just released (by order only) this new and EXCITING DIORAMA! This colorful poli-resin diorama depicts an exciting scene from the 1989 Toho Co. Movie “GODZILLA VS. BIOLLANTE!” The Heisei Godzilla in the diorama stands approx. 4 inches tall. 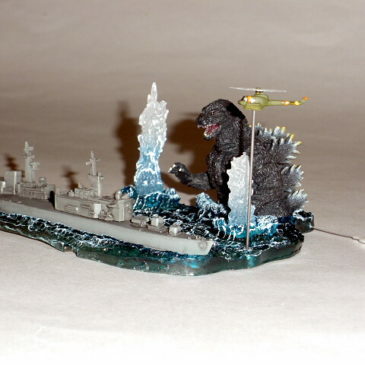 The diorama can be displayed with the ship in the foreground in working order, or when you add Godzilla’s ATOMIC BREATH, you can display the ship blowing up! The diorama also includes a mini military helicopter and you can see where the shots fired by the Japanese Navy are raising large water spouts around an ANGRY GODZILLA. This highly detailed diorama comes with decals to put on the helo pad on the back of the bigger ship. This diorama was just released Sept 25th at the “MONSTER SUMMIT 12” that was held at the LOFT PLUS ONE in the Shinjuku area of Tokyo. COMES MINT IN BOX.